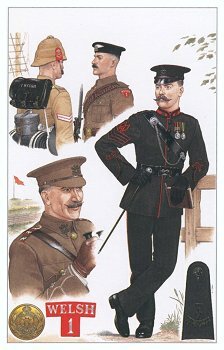 *A corporal arriving in South Africa wearing Slade Wallace equipment 1899. The figure at top centre wears Service Dress, Broderick cap and Mounted Infantry equipment, 1906. 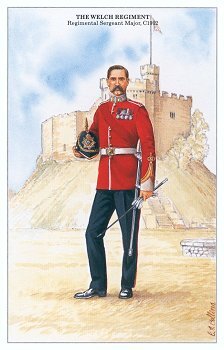 The officer wearing Service dress is in 6th Welsh (TF), 1909. Background: The Keep, Cardiff Castle. 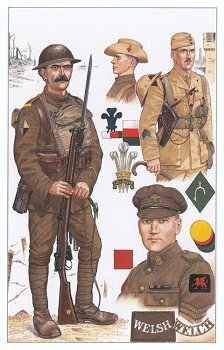 *The main figure depicts a private of the 18th (2nd Glamorgan) Welsh (Bantam) Division. 1917. 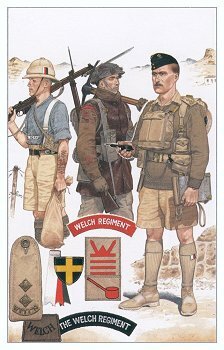 *The left hand figure depicts a private of the 2nd Welch in India's North West Frontier 1934.
at right is a lieutenant of the 1st Welch on Crete 1941. 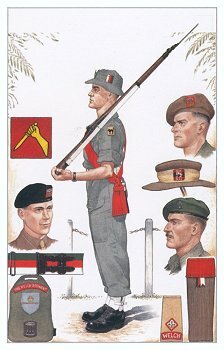 The central figure is from the 1/4th Welch in North West Europe in the winter of 1944/45. He wears a serge-lined leather jerkin over his battledress. *The main figure shows a Company Sergeant Major of the 2nd Welch at Toungoo, Burma. He wears a jungle -green uniform. 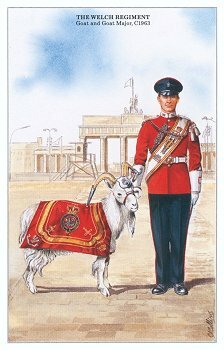 Other headdress worn by the 2nd Welch at this time are shown. *These plates are reproduced by kind permission of Wessex Military Publishing, PO Box 133, Deal, Kent C14 9YT, From their book "The Welch Regiment"